nCr = n!/(r! . (n-r)!) or nPr/r! permutation & combination calculator - step by step calculation to find number of different permutations nPr & combinations nCr provided along with meaning, formula & solved example problems for statistics data analysis. Users can get the complete step by step calculation for each calculation they do by using this calculator. nPr - permutation calculator finds the number of different permutations of n distinct objects taken r at a time where as the nCr calculator finds the number of different combinations of n distinct objects taken r at a time. The factorial of number calculation one of the primary part in both permutation & combination calculation. The below solved example problem may useful to understand how the values are being used in permutations P(n,r) & combinations C(n,r) calculation by using the above formulas. Find the number of different permutations nPr & combinations nCr of a box containing 6 distinct colour balls taken 3 at a time? 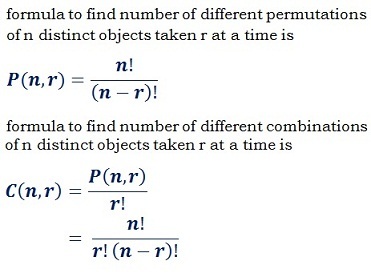 formula to find permutation nPr = n!/(n-r)! nPr = n!/(n - r)! Each r combination can be arranged in r! different ways. Then the number of r-permutations is equal to the number of r combinations times r! 5! = 5 x 4 x 3 x 2 x 1 = 120 and so on. In many applications in the field of probability & statistics, finding the permutations & combinations is very important to analyse and summarize the statistical data. The above formulas, step by step calculation & example solved problem help users to understand how the values are being used in nPr & nCr calculations and how to be done such calculations manually but, when it comes to online for quick computations, this permutation & combination calculator help users to workout, perform & verify such calculations as quick as possible.